First published in Next newspapers, March 13, 2011. Reproduced for archival purposes only. Nwankwo has been harshly criticized for his views, but he has a point. 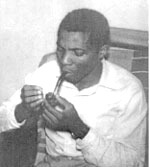 Many Nigerian thinkers that I greatly respect and admire point out Okigbo’s youth and observe that “derivation” of others’ works was common practice at the time. But then if someone had shown me Sandburg’s lines without attribution, I would have sworn that it was Okigbo’s voice. Which begs the question: How much of Okigbo’s voice is borrowed or “derived”? Derivation is nothing new. The late Ola Rotimi made it very clear that his play The Gods Are Not To Blame was an adaptation of the Greek mythology Oedipus Rex. Wole Soyinka has been careful to make the connections between his plays and external influences. So is Okigbo guilty of plagiarism? Yes, I agree with Nwankwo There is no attribution as far as I can tell; if there had been notes explaining this, it would be reasonable to see this as an experiment. A poem is a spiritual journey undertaken by the poet-priest, a deeply personal journey that finds voice in poetry. If I was to take a renowned writer’s work and incorporate it into mine, I would be required by traditional conventions to cite the source. If I was to come up with a copy of it, using most of the language, without attribution, it is possible that it would speak to a reader as the original spoke to me. If the reader was to find out that indeed, this new story used language and themes virtually lifted (in Okigbo’s case, about 80 percent) from the original, the reader would feel a certain sense of disappointment. There would also be questions as to whether indeed the writer undertook that journey personally. There is a software out there that determines how much of a student’s work is similar to work out there. Okigbo’s piece would have been unacceptable today were it to have been submitted as original work, no ifs, no buts about it. More importantly, it raises reasonable questions in my mind about how much of the spiritual journeys in his works were his journeys. I think that is an important question. Donatus Nwoga wrote an excellent paper on the subject titled Plagiarism and Authentic Creativity in West Africa. The paper showcases several other instances of plagiarism by Okigbo. Take this piece by Miguel Hernandez, the Spanish author of “El amor ascendia entre nosotros“: “ Love ascended between us like the/moon between two palms/that have never embraced;/Love passed like a moon between/us and ate our solitary bodies/ And we are two ghosts who seek one another/And meet afar off. Here is Okigbo’s “Lament of the Lavender Mist”: “The moon has ascended between us—/Between two pines/That bow to each other;/Love with the moon has ascended,/Has fed on our solitary stem;/And we are now shadows/That cling to each other/But kiss the air only. Here are lines from Alberto Quintero Alvarez: “What departs leaves on the shore/Gazing seawards at the star foreseen;/What arrives announces its farewell/Before a coming-and going that goes on for ever. These pieces and several other instances in Nwoga’s excellent paper offer evidence of plagiarism; if it is “derivation”, it is actually poorly done, with little attempt at creativity. I believe my friends who assert that these forms of imitation were common practice at the time but it would be impossible to defend this conduct today. I am in awe of Okigbo and I doubt that the day will come when someone would convince me that he was anything less than a genius. But let’s call what he did by the real name: Plagiarism. And it matters, because it was wrong. Okigbo is no less a genius. He did well with derivation. But the man is guilty as charged. He neglect to attribute the sources of his non-original inspired poems. But who am I to judge the dead? While still we live, we are wont to toe the labyrinthine path the man also tread while still he lived. Though I am very disappointed in my icon after reading this article, I still think he was a great poet. A genius! Of course, I believe plagiarism can not be said of all his poems.